When surfaces need to be disinfected the choice of the disinfection is as important as the duration of exposure. The Menno disinfectant applicator will provide foam on the surface, therefore the surface will be moist for a longer time, extending the time of exposure sufficiently.The Menno disinfectant applicator is developed to disinfect properly and saves you time and product. Using foam will guarantee an expanded moisture time of the surface extending the time for the detergent to combat harmful organisms, resulting a better disinfection. The foam is clearly visible and makes it easier to use, no spots or corners will be missed. 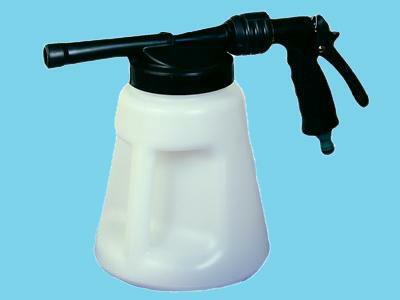 The MENNO disinfection applicator is filled with the product concentrate (3 liter) and connected onto a garden hose with a regular Gardena connection. The dosage can be adjusted by using different colored plugs (see table). It is not necessary to prepare the solution as it is ready to use, so no product will be left over.The detergents MENNO florades and MENNO ter forte are stable and allows the MENNO disinfection applicator to be stored until the next time of use. For the right dosage choose the coloured plug as indicated in the dosage table. Place the plug with the small side up in the intended opening (circled in the picture). Place the transparent suction tube over the plug. Fill the tank with the concentrated detergent. Connect the disinfectant applicator to the garden hose by using a regular Gardena connection. The disinfection applicator is now ready for use. For more information or other horticultural products please contact your Royal Brinkman area manager or ask for a quotation. +31 174 - 446 100.